A cut-loose, swingin', syncopated contra dance & concert band! Welcome to the Wild Hair website! This is where you'll find the information you need to make a completely impulsive selection of our music for your next dance, concert, workshop, festival, or CD/digital player. Feel free to poke around, then contact us at wildhairmusic at gmail dot com for more information or a booking. 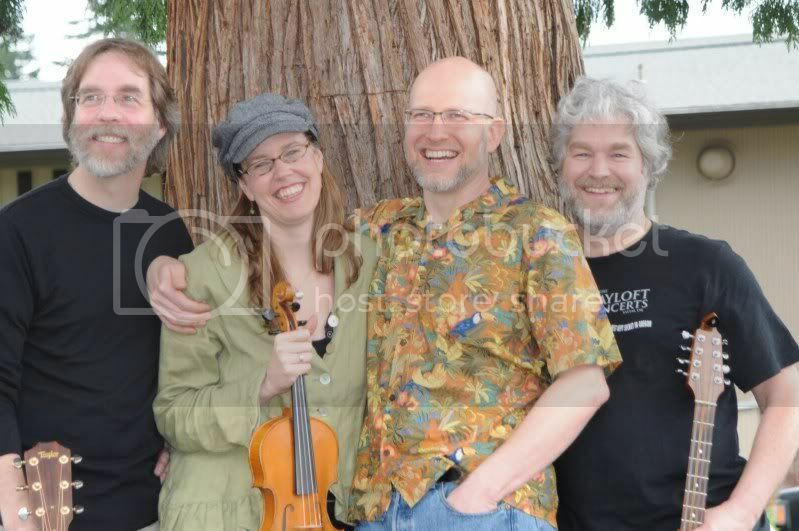 Fun, eclectic Portland Oregon-based dance band Wild Hair generates ecstatic grinning with addictively danceable fiddle tunes and songs from Ireland, New England, Appalachia, French Canada and points beyond. Skilled, swingy fiddler Betsy Branch, versatile Todd Silverstein (pennywhistle, alto sax, bouzouki), percussive guitarist Jeff Kerssen-Griep and syncopacious pianist Mark Douglass sync up a propulsive, loose-limbed groove that's spontaneous, harmonious, welcoming, tight, feisty, and fun, played with contagious good humor aimed at your feet. Visit "Our Tunes" to see and hear the band... Welcome!